These three cute looking stars in their childhood have definitely got a good start in their acting career. But along the way, things have changed in them. Their characters and priorities have changed. Lindsay Lohan got into multiple legal charges. The same with Macaulay Culkin who got involved into drugs. And then Amanda Bynes who also got arrested for several violations. Some celebrities don’t get to escape from burglars these days even how tight the security of their homes. Some of these celebrities include Kirsten Dunst whose house got burglarized while in a shooting. Orlando Bloom’s house also had a break-in in New York. Kate Moss, Willem Dafoe, and P. Diddy have the same experience as well. Crimes do happen regardless of anyone’s social status in the society. Tax evaders are also criminals in the eyes of the law. In Hollywood, some celebrities have problems on thier taxes not being paid. Some of them include Teri Polo, Aaron Carter, Faith Evans, Robert Redford, and Chris Tucker. You find out in the infographic below how they became problematic to tax evasion. It is a serious crime which could legal to legal proceedings if one does not settle it right away before the court. Celebrities are frequently reported to have been arrested due to DUI offense because they are always in parties and gatherings where alcohol, liqours or wines are being served. And so, when they drive home they most of the time meet accidents along the road and they are reprimanded by the authorities in the end. Please see more instances and cases of DUI violations from the infographic below. 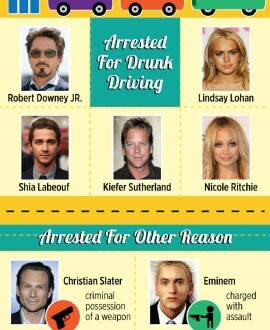 A number of famous celebrity stars have been arrested due to Driving Under The Influence. Among them are Lindsay Lohan, Keifer Sutherland, Gary Collins, Michelle Rodriguez, Chris Klein, Rip Torn, Vince Neil, Gary Dourdan and Nicole Richie. They all had their taste of being jailed and it was not good after all because they had to go through the legal process and all the stress which they deserved to deal with. Even the known and popular artists can make mistakes in their lives to the extent that they got arrested by authorities by doing something unacceptable in the society. These celebrities include Robert Downey Jr., Kiefer Sutherland, Shia Labeouf. Christian Slater got also arrested for illegal possession of firearm and then Eminem was charged with assault. The celebrities that you idolized certainly commit mistakes as well because after all they are humans like us. You would be surprised at some of the violation they have been into in the past. Some of these offenses include DUI, addiction, fight and other violations. Please see infographic below for you to find out what offenses your idols did in the past and how they were able to survive today. Some celebrities are not only popular or famous in movies but their names also came out in the media as they committed certain crimes which they had to settle with the government authorities. Some have been arrested for violating the law on DUI, they include Mickey Rourke, Michelle Rodriguez, Kiefer Sutherland and others. They definitely are still humans and are subjected to the laws of the land. They need to abide the law or suffer the legal consequences.